This fantastic 3 bedroom 1 bathroom townhouse is found in the village Almanzora which is just outside of Cantoria with many amenities within walking distance including shops, bars, restaurants, schools, pharmacy, banks, etc. 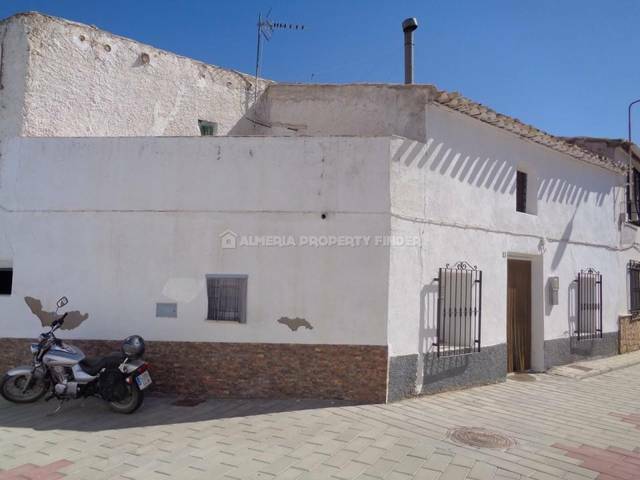 This spacious property measuring 109m² could make an ideal home either for permanent living or as a second home in the sun. As you enter the property you find yourself in a large entrance hall where you have a W/C to your left. Straight ahead there is an internal patio with a utility area followed by the fully fitted kitchen which comes with all white goods. Finally you have the lounge/dining room which is a great size and has an abundance of natural light. Upstairs you have 3 large double bedrooms as well as the main bathroom. A further set of stairs takes you up to a private roof solarium where you can enjoy fantastic views of the surrounding town, countryside and distant mountains. This area is perfect for enjoying the sun and a BBQ area means you can also dine al fresco. The property is sold with an underground garage space to park your car in the shade. The owners have also indicated that the furniture can be included in the sale, subject to negotiation. A must see property for those looking to immerse themselves into the Spanish culture of village living. Another bonus for this properties location is the close proximity of the coast; Mojacar’s beaches can be reached in around 35 – 40 minutes. The airport of Almeria is around a 1 hour, 15 min drive. Murcia San Javier airport is around 1 hour 30 minutes and Alicante approximately 2 hours.